We believe that your outdoor space should provide enjoyment, relaxation and beauty without hassle. With a complete range of landscaping services, our team will design, build and sustain an outdoor experience that complements your lifestyle and doesn't require extensive maintenance. Regardless of what service or mix of services you need, we have the expertise to do the job right the first time. We listen carefully to what you want, thoroughly assess your unique situation, and create a solution that works for you. Call us to learn more or schedule an appointment. Columbus, Ohio’s Award Winning Tree Service Provider! Pruning and trimming trees doesn’t just add aesthetics to your home, it also makes your trees safer by removing hazardous dead or weak branches. However, the health of the tree must also be taken into account. Pruning too many or the wrong branches puts significant stress on the tree. Our professionals carefully prune your trees to maximize the look of your landscape and preserve the health of your trees. 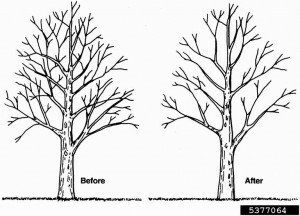 The most common types of pruning are clearing, to remove dead, dying or diseased branches, thinning, to increase light penetration and air movement, raising, to remove lower branches to clear buildings and structures, and reduction, to reduce height or spread of the tree to clear utility lines. It’s important to remember that “topping” a tree is no longer considered an acceptable practice because it is harmful to the tree. Health – It is sometimes possible to save an infected tree by strategically pruning away affected branches and limbs. Thinning the crown of a tree improves airflow, which can be very beneficial. 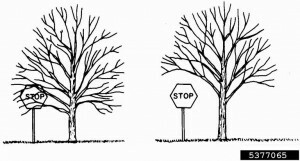 If branches are crossing or rubbing together, they should be trimmed so that they don’t fall unexpectedly. Be conscientious about the size of the branch that you are going to remove. If it is less than five centimeters in diameter, removing it is fine. If it is between five and 10 centimeters in diameter, you might not want to do it. If it is more than 10 centimeters in diameter, you should only do so if you have a really good reason. Lateral branches should be between one-half and three-quarters the diameter of the stem at point of attachment. Otherwise, they should be removed. 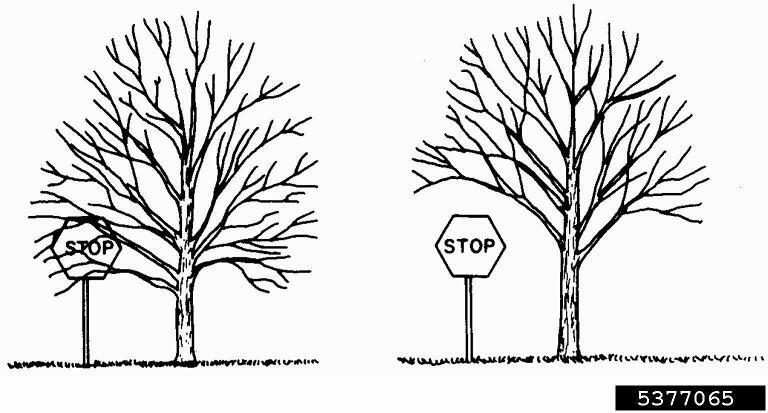 When pruning is complete, the ratio of living crown to tree height should be two-thirds. Try to prune away branches when they are young. They are much easier to manage at that point, and the risk of leaving nasty scars is much lower. Don’t trim a branch too close or too long. You shouldn’t leave a large stub or remove the branch collar. The following tips and techniques will help guide you if you’re planning on pruning a tree or if you just want to educate yourself about typical tree trimming care and maintenance techniques. Keep lateral branches as evenly spaced as possible, especially on young trees. Never remove more than one-fourth of a living crown at once. If you need to remove more than that, spread it out over a number of years. 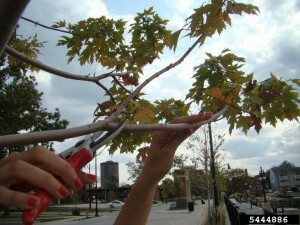 If you need to remove more than half of the foliage from a branch, just remove the whole branch. Only reduce the crown of a tree if it’s really necessary. Prune lateral branches that are at least one-third of the diameter of the stem that needs to be removed. 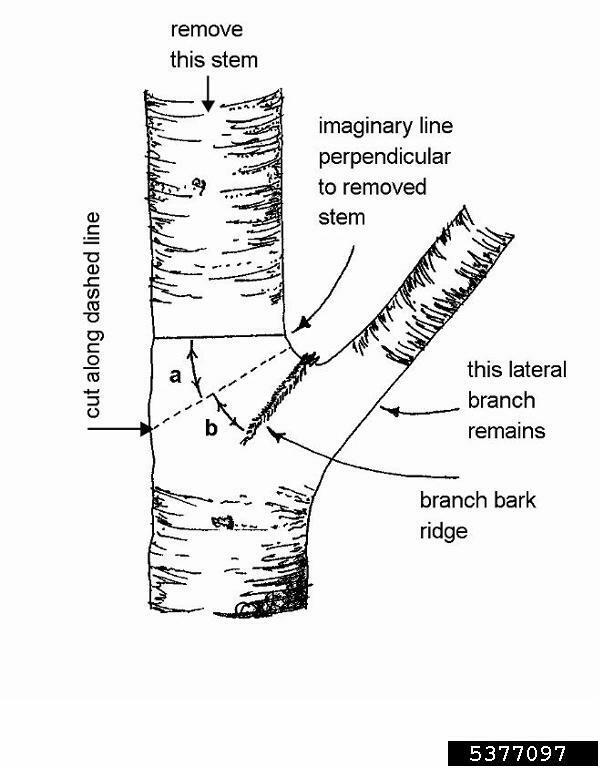 Before making a cut, look for the branch collar, which grows from the stem tissue at the bottom base of the branch. 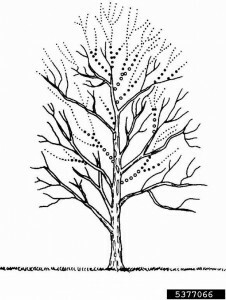 Look for the branch ridge, which is on the upper surface and is parallel to the branch angle at the stem. Use the same technique to prune dead branches and living branches. 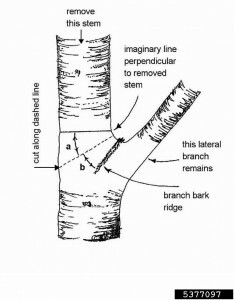 If a stem is too long, use the three-cut technique: Make a notch on the side of the stem that faces away from the branch that’s being retained; make the second cut inside the crotch of the branch and above the branch ridge; the third cut will remove the stub by cutting through the stem parallel to the branch bark ridge. Keep these tricks and techniques from this tree pruning guide in mind before taking on the task of pruning and trimming your trees. We employ the latest techniques in tree growth technology and soil remediation to ensure that your landscape remains healthy above and below the ground. Through pneumatic vertical mulching, we’re able to fracture heavy clay soils to create more space and aeration for the tree root system. This technique doesn’t damage roots or buried utility lines. Ray Trenching is the process of installing trenches away from the tree in a radial pattern to allow for irrigation, aeration, reduced soil compaction and better drainage. This technique encourages a balance of nutrients, oxygen and moisture that results in healthy young or mature tees that are more resistant to drought. A blanket of mulch provides much needed protection for the tree, reducing foot traffic near critical roots and minimizing exposure to mowers and string trimmers. By helping maintain optimal temperature and moisture levels, mulching enhances aerations, nourishment, earthworm activity and nutrient distribution. Vertical mulching is an excellent technique used to partially alleviate soil compaction within the critical root zones of trees. Soil compaction is harmful as it reduces the amount of pore space in the soil normally filled by oxygen (micro-pores) and water (macro-pores). Vertical mulching will also lessen damage due to excessive water, preserve necessary aeration during wet periods, allow sub-soil water penetration during dry periods, and promote the formation of fine feeder roots. Whole Tree Care By Trapper’s Tree Service utilizes the latest technology in Vertical Mulching and Fertilization by implementing the Air Spade in place of the older and out of date auger method. We have done this because air will not damage the roots and achieves a better outcome in Soil Density Reduction! To vertically mulch your tree, air spade two inch wide, 18″ deep holes in the soil on 12-20″ centers under the affected trees starting at about 8 feet from the trunk and out to the drip line of the branches (where fine feeder roots are located). This area is also called the edge of the critical root zone. If you hit a large root, just move over and complete the hole. You should have a grid of holes toward the outer edge of the CRZ. Fill holes with a mixture of pea gravel, or sand, or a mixture of compost with pea gravel or sand. A 3-4 inch layer of good quality organic mulch, such as aged wood chips, leaves, compost, or pine straw spread evenly over the entire critical root zone will also help trees substantially. If you suspect tree damage, it’s important to call us as soon as possible. We inspect and assess your unique situation and determine what corrective measures need to be taken to keep your trees strong and keep our family safe. When pruning isn’t enough, we may need to install structural support cables or braces. Cabling is a process that involves supporting weaker parts of the tree by attaching them to stronger parts of the tree. Bracing is used to strengthen cracked areas, limiting their ability to spread further. If you have a leaning tree blown over by the wind, we may be able to stand it back up and support it with guy wires. We use Duckbill Earth Anchors, a system designed to withstand up to 1,100lb force – so you can be sure that your tree will remain stable. Tree removal is the most challenging and potentially dangerous service we provide. A great deal of training and experience is required to remove trees properly. That’s why we always work with you to consider other possible alternatives. When removal is the right solution, you can be sure that Whole Tree Care adheres to all industry safety standards. While dead, dying or heavily damaged trees are the most common candidates for tree removal, there are other reasons you may need this service. We carefully evaluate your property to determine if you have any hazardous trees, due to circumstances such as hollow spots or weak root bases, or if you have any trees that pose a threat to your home because of their proximity. Other reasons include construction or landscape projects, the need to thin growth, or even aesthetic reasons. Together, we’ll plan the best course of action for your needs. Whole Tree Care is Columbus, Ohio’s preferred provider of emergency tree service. Whenever fallen tree branches or tree trunks are a danger to your property or power lines, we have the tools to handle it. We’re on call at any time and we’ll be at the scene at a moment’s notice to quickly assess the situation and develop the safest, most effective solution. We are available year around, 24 Hours a day. We also understand that cost is always a consideration when choosing emergency service. We’re proud to offer competitive rates and budget-friendly options for residential and commercial clients alike. When you have an potentially dangerous tree emergency, our experience and customer satisfaction guarantee provide the peace of mind you need. Some jobs require heavier equipment, including a mobile crane. We offer a crane for hire on all types of projects from new-build construction to delicate lifts. Our staff is highly qualified and operates our equipment safely and carefully. Crane Services are available for as little as $100 per hour. We are also experienced utilizing bobcat skidsteers for jobs both large and small. For any task around your home or job site that requires heavy lifting and a delicate touch, we experts your should call. Bobcat Services are available for as low as $75 per hour. Call us for details and make your next crane or Bobcat project safe and affordable.